One of the papers from the Human Media Lab accepted to the ACM Symposium on User Interface Software and Technology Symposium (UIST 2016) in Japan, describes HoloFlex, a light-field-enables flexible smartphone. HoloFlex sends different light rays to multiple angles, allowing the device to display stereoscopic and motion-parallax-enabled 3D imagery. 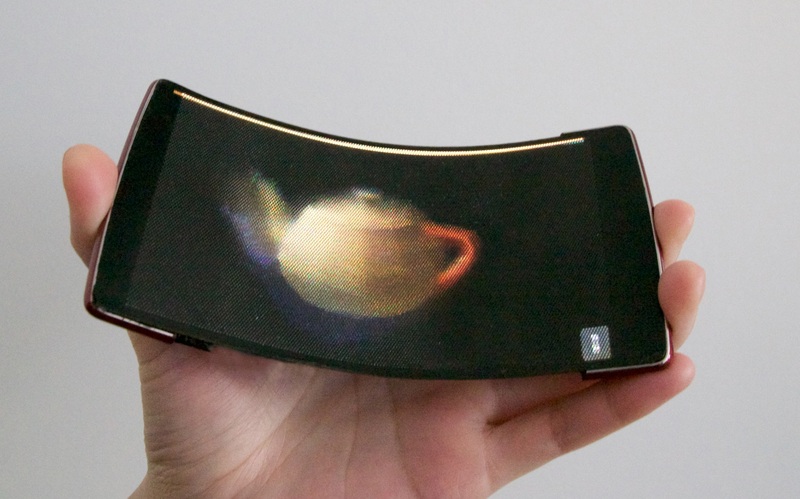 Additionally, bend sensors offer new ways to interact with 3D content: instead of mapping X and Y drag gestures to the Z axis, bend provides a natural way to move objects perpendicularly to the screen surface. HoloFlex was also presented as a demo at the ACM CHI Conference earlier this year. The official press release about the demo can be found here.